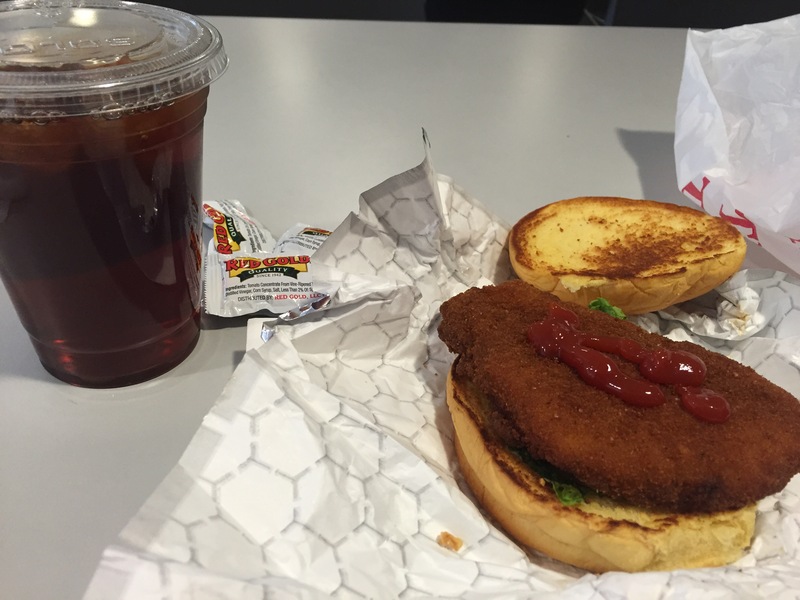 The name of this sandwich is a misnomer: Crispy Chicken Italian for $6.45. Herbed mayonnaise does not an Italian sandwich make; perhaps some basil, tomato sauce, even some mozzarella cheese (for those who can digest it), but not herbed mayonnaise and NOT American cheese! Besides, the sandwich tasted fabulous, with added ketchup (a girl’s best friend), with lettuce and tomato, minus the cheese. This is why people come to the Burger Garage; the food is so damn good! I watched the other orders made for pick-up: The milkshakes looked amazing and creamy, the fries perfectly crisped and golden, and the burgers gleamed with flavor with melted cheese on top. It took fifteen minutes to get my to-go order, the place was packed to the gills. People were impatient for the goods. Paired with an unsweetened ice tea, this lunch was tops. I only wish it was simply called the Crispy Chicken sandwich. Basic would be good. With food like this, you don’t need anything else.